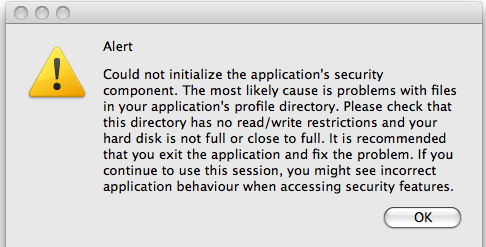 Firefox cannot initialize the application’s security component. I have noticed this alert showing up when I start Firefox. After experimenting, I have found the solution. On a Mac go into th ~/Library/Application Support/Firefox/Profiles directory and cd into your profile’s directory. Remove the cert8.db file and restart Firefox. Firefox will regenerate a new file and sites that use https will start working again.